Since its founding in 1909, the National Association for the Advancement of Colored People (NAACP) has been at the forefront of the fight for civil rights. 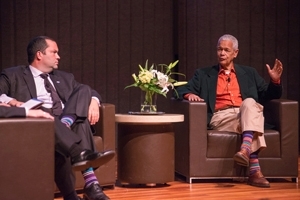 Two prominent leaders of that organization—former chairman and current board member Julian Bond and outgoing president and CEO Benjamin Jealous—took center stage for a lively discussion at American University’s Katzen Arts Center on Monday evening. The event was one of the University Honors Program “Tea Talks,” informal gatherings between students, AU professors, and other leading professionals. Bond is a distinguished adjunct professor of government at AU, and he’s currently teaching an oral history of the civil rights movement for honors students. Jealous has a family connection to the school: His wife, Lia Epperson, is an associate professor at American University Washington College of Law. “We try to make these Tea Talks as conversational as possible. And usually we hold them in a small space, and we have about 15-20 people show up. Well, here we booked a much bigger hall because this is a big event,” said Michael Manson, the interim Honors Program director who moderated the panel. Bond and Jealous share the same goal of eliminating race-based discrimination, but they come from two different generations. Bond was a founding member and spokesperson for the influential Student Nonviolent Coordinating Committee in the 1960s. Having attended the landmark 1963 March on Washington, he was in constant demand during the recent 50th anniversary of the March. A former investigative reporter, Jealous was born nearly 10 years after the March and became the youngest person ever to lead the NAACP in 2008. Yet they both touched on similar themes on Monday night, with special attention paid to voting rights. Jealous was particularly critical of voter ID laws introduced and passed at the state level in recent years. He doesn’t buy the argument that new laws are needed to combat voter fraud, and he compared this agenda to poll taxes and literacy tests used in earlier times to prevent African-Americans from voting. “We’re heading back into a period where people are using the law to suppress the vote,” Jealous warned. “If you look at minority communities, they are less likely to have the kind of voter ID that many Americans have. I can remember having seen [voter suppression] in the 1970s, and I’m not surprised to see it repeated again,” Bond added. The legacy of the March on Washington was also a central theme on Monday. Bond said that, at the time, few people realized just how momentous the event would become. “It was only when I was driving from Washington back to my home in Atlanta that I heard on the radio newspaper estimates of how big the crowd was. Then I thought this really has been something. And I’ve been part of something magnificent,” Bond recalled. Jealous spoke of more recent civil rights marches, including the 50th anniversary event. “The last thing you want is a commemoration. We’re still in the midst of the civil rights struggle in this country, and we’re not yet in a place where we can don blue and gray and go be re-enactors,” he said. Bond and Jealous took questions from students, and they offered advice on activism and leadership. Jealous suggested students bring a winning mentality to any issue they engage in. “If you’re going to get into activism, please don’t do it to fight the good fight and lose,” Jealous said. Bond insisted that the ability to create change can be “the greatest feeling” of your life. “I thought it was incredible. It was such an honor to be in there with them,” AU public policy graduate student Whitney Hoft said afterward.